soaked up all the good flavor, to serve them with some crusty bread. the cheese is gone and use it for salad dressing. Fantastic. garlic, basil, thyme, and rosemary. flavor from herbs and garlic. Sounds just fantastic to me. I like cheese in any form. I might be able to give up meat, but cheese, never! You’ve discovered one of my personal favorites! I love those Capriole thimbles — and since they freeze, I make sure I have a bag or two in the freezer for just this very thing. 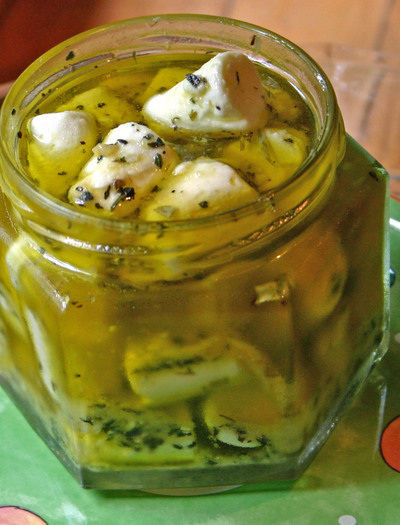 Also, the oil, and little bits of goat cheese at the bottom of the jar are great in salad dressings. I couldn’t imagine living without the sense of smell, it triggers so many memories and emotions. In any case, I marinate fresh mozzarella all the time, but have never tried doing it with chevre. And I also use the leftover oil for salad dressing when the cheese is gone. Just add some fresh lemon juice and you’re good to go. I can’t wait to try this! Beautiful close-up photo, by the way. Good suggestions, all! Cheese may be my favorite food, Kalyn. I *have* given up meat for the most part, but cheese is essential! Renee, great idea to add leftover olives (I am also an olive fiend.) Lisa, I marnate mozzarella for antipasto plates, but haven’t done it like this. Excellent suggestion. A couple of our local farms make killer fresh mozzarella. 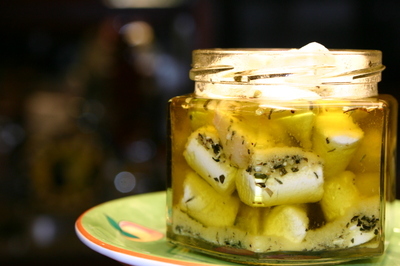 That infused oil and cheese looks delicious. We love all of cheeses that Capriole makes. p.s. Please give Zoe a hug from me. She has such a look of wisdom about her. Hi J — Long live funk!